Come to the shop on the hill and meet Annetta, who is joining us all the way from Beloit, Wisconsin. We are thrilled to have her here to teach, Saturday/Sunday, May 18 and 19, 2019. Annetta is our Featured Artist for 2019 and she brings a new perspective to the art. What a great time to travel up here. Everything will be in bloom and it will be time to relax on the deck with your friends and do some wonderful weaving projects. Annetta brings her many years of design, creativity and skill to share with you. She travels the country teaching her unique and colorful art and we’re thrilled she chose us in New Hampshire as part of her tour for this year. 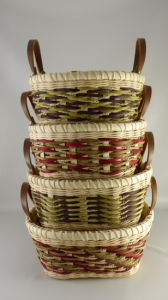 On each day you will have several choices of baskets but she is also offering a special Surprise class to you. There will be a mini weaving Surprise project on Saturday evening that will include pizza. Feel free to join us for this Surprise class, even if you didn’t make it to class during the day. Strata is an attractive tote made to hold up for daily use. The sides of this tote are woven in a 2/2 twill, which makes a direction shift at each corner. The overlays are added to spice it up. It is finished off with leather handles to match your overlays. Stakes are black, choice of red or turquoise overlays and handles. Braided Muffin basket is a wonderfully useful basket! 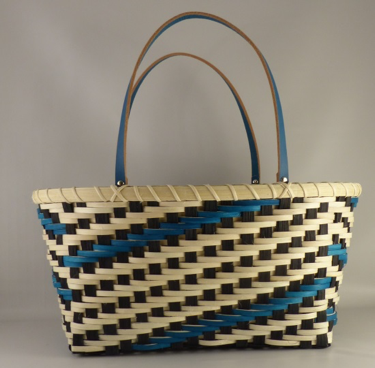 While the basket has several techniques that can be applied to other baskets, the main focus of this class is the three strand braid and understanding its complexity. Students will have several color choices for the braid. 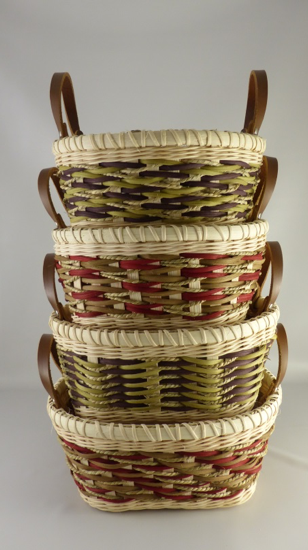 Seagrass Storage is also being offered on Sunday. Please read the information above if you would like to make this basket and indicate on the registration form below which day you want. Payment is due immediately. Make checks payable to Jean Reed and mail to Murray Hill Weaving, 685 Murray Hill Road, Hill, NH 03243. Be sure to forward your registration form. A $35 registration fee, per class is due to Murray Hill which includes your lunch. There is no registration fee for the Surprise class on Saturday evening. A menu will be passed around during class for an incredibly good local deli and I will pick up the order. Due to the high cost of materials, extensive hours of preparation, and travel expense, we appreciate that every effort is made to attend class and be on time.